Brazil: New stadium in Natal to be ready in late 2013? 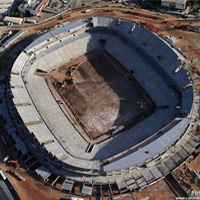 Construction of Arena das Dunas was due in early 2013, according to Jornal de Hoje. Now six months behind schedule, works are nearly 72% done and there’s still time to make it up. All of the main concrete structure is done, seeing Natal get new, double-tiered stands. In June we should be seeing first elements of the steel roof structure rising, while preparatory works for the future pitch is already ongoing. With 1,800 people working on site, FIFA should accept delivery in late 2013 or early 2014 at the latest. Practice shows that World Cup venues delivered 6 months ahead of the tournament see no trouble in hosting games. Arena das Dunas will seat some 45,000 people with 40 skyboxes located in the west stand. Initial concept by Populous saw all fans being covered with a distinctive roof divided into individual sections. However, over time the cover has been changed and in the end will not protest fans behind goals.